InputArea - This is an embedded RadInput control, which validates dates or times as the user types. 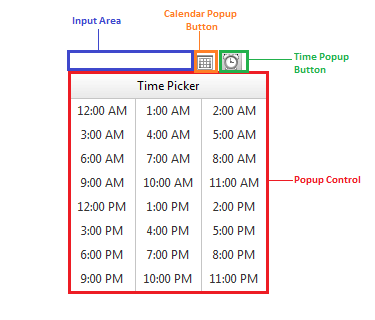 Popup Control - This is a RadCalendar control that is shown in a popup element, so that the user can select a date by clicking on the desired selection. Calendar Popup Button - an image button, displayed next to the input area that shows and hides the popup control. If the popup control is a RadCalendar control it must have AutoPostBack set to False in order to work properly. This means that a popup calendar cannot be used in multi-view mode.